During Christmas I somehow came down with tennis elbow and went to my first physio appointment for it on January 11th. The next day my elbow hurt like hell but luckily I already had an appointment set up with here. It turns out I basically ruined a week and a half of her work. 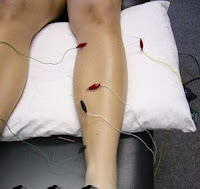 Lauren, my physiotherapist, has help me in the past half year with my feet falling asleep when I walked and a knee issue. I have a lot of faith in her so am faithfully doing what she tells me to do ... well, except the night she had told me not to do lunges at fencing practice and I thought she meant not to do full complete lunges. So now I do exactly what she says. I have two sessions a week, in which she uses Active Release Technique therapy (A.R.T. ), ultrasound and a tens (transcutaneous electrical nerve stimulation) machine on me. It has been helping and the pain is decreasing. This past Saturday she thought it was a good idea to start back with yoga but not to push it. I have gone twice this week and, yes, feel an improvement. A.R.T. "Contemporary Acupuncture is a precise technique in which fine solid needle s are inserted into areas of the body that neurologically relevant to the condition. The needles are either stimulated manually or with electricity for the therapeutic purpose of modulating abnormal activity of the nervous, endocrine, immune systems and their effects on the body." It was weird as she placed pins in my hand, arm, elbow, shoulder and even a single one in my head. Then she turned on the power. Nothing ever hurt but my fingers and hand were twitching pretty good. It was very much a weird sensation. Not alarming or uncomfortable but different. In fact, I got very sleepy at the end. After she did a very deep active release into the tendons and muscles of my arm. It sure woke me up. It is coming along. I need to continue twice a week with her, keep my arm stretched, use it as little as possible, especially with mousing, and, of course, ice it every night. I am told to continue yoga but no lunging yet for fencing for at least another week. I have learned to take her advice and again her advice and treatment is helping. Tonight my arm is feeling much better than before I went in.